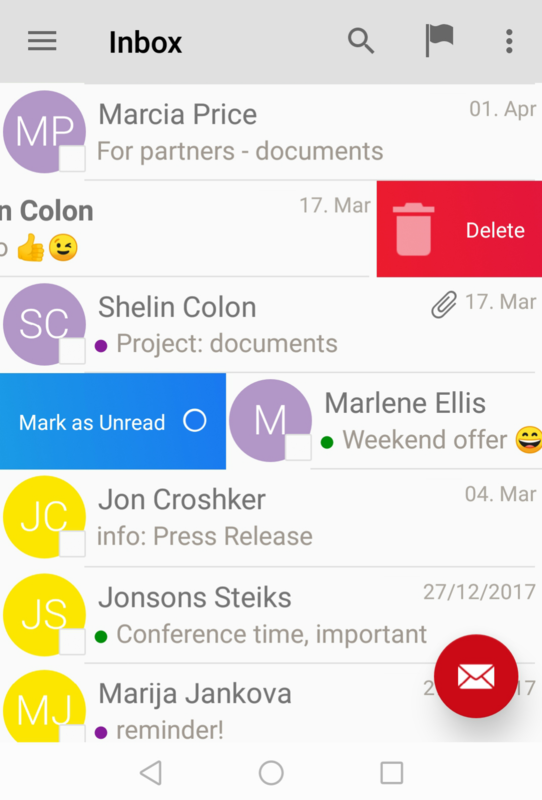 Our developers have prepared a new release of the Inbox.lv Android application, where the main change is new Swipe realization. Two new and bright options have replaced the old gray deletion icon. The first new feature in our application changes the status of the message to “Read” or “Unread” using the swipe from the left side. The second is the instant message deletion using the swipe from the right side. This functionality in the new version of the application has a new look, it became brighter and easier to use. But the time counter until the end of the letter deletion, which previously could be seen next to the Delete button, was completely modified and transformed into a new functionality called “Undo Delete”. The ability to restore a message immediately after deletion has been introduced because we understand that often work with inbox.lv mobile app occurs in a “fast mode”. Reading, browsing and sorting a flow of mail, means that users often get lost in their activities and may accidentally delete important messages. So, in order not to spend extra time searching and restoring accidentally deleted letters from the Trash, you can always quickly and conveniently return the letter back. The “Undo” feature will be displayed in a pop-up window at the bottom of the screen immediately after deleting any message. It should be noted that this option restores only to the last deleted message. If messages are deleted one by one, then only the last one will be restored. But if several messages were marked in the list and the “Delete” button was pressed for all of them, the “Undo” will return all previously deleted messages back to the folder. We have also added new icons. Old arrows for displaying the status of the letter were replaced by colored dots. Unread messages are marked with a blue dot, answered with green and forwarded with purple. If you haven’t yet updated your mobile app – you can do it right now! The latest version of the app is already available in the Play Store. Remember that you can get updates as soon as they are available. You just need to turn on the auto-update setting. Do not forget to leave your feedback and suggestions – email us – feedback@inbox.lv or use the feedback form. We care about your comfort! This entry was posted in About our products, News and tagged android, email, mobile, mobile app for android. Bookmark the permalink.